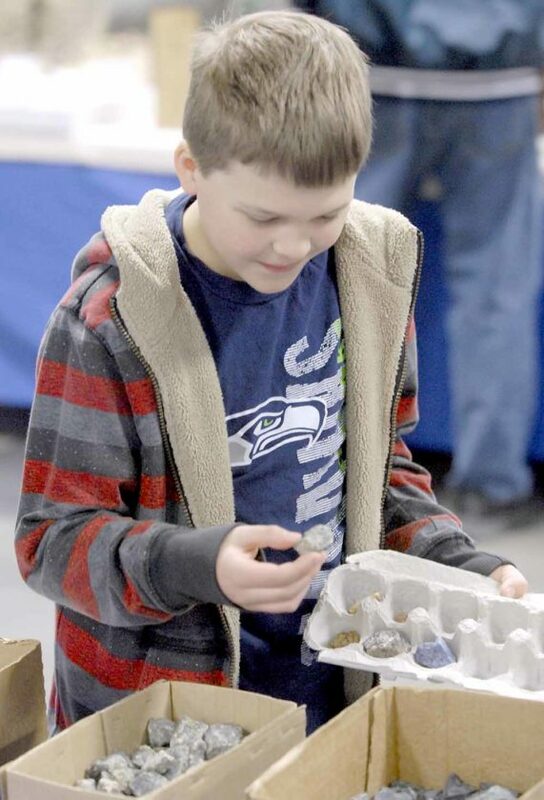 Sam Guddall, 11, of Fort Dodge, selects a few rocks to add to his collection Saturday during the River Valley Rockhounds, Inc. Gem, Mineral and Fossil Show on the East Campus of Iowa Central Community College. 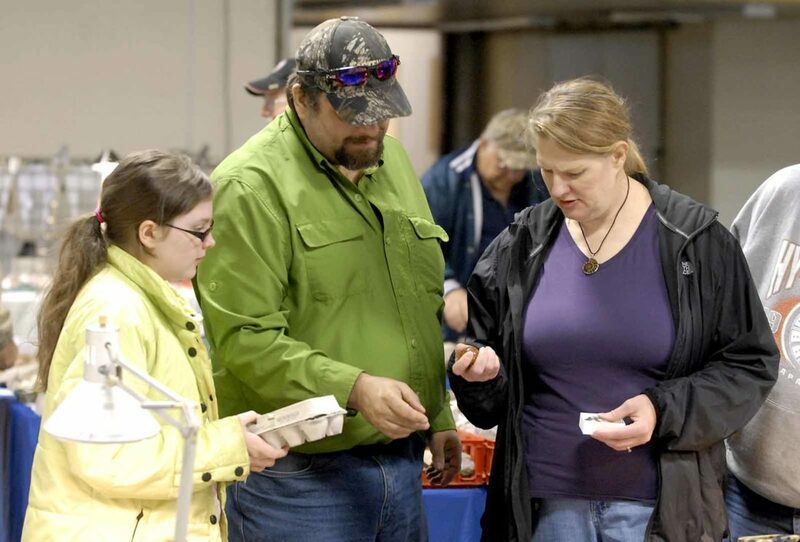 Dok Dehring, of Humboldt, at right, looks over a specimen Saturday with her husband Aaron Dehring and daughter Amelia Dehring, 10, during the River Valley Rockhounds, Inc. Gem, Mineral and Fossil Show on the East Campus of Iowa Central Community College. Dok Dehring has a pretty good idea of what she’s looking at, she holds a master’s degree in geology. This year’s River Valley Rockhounds Gem, Mineral, Jewelry and Fossil Show at the Webster County Fairgrounds is being dedicated to longtime club member Hugh Carroll who died shortly after last year’s show. According to club President Robert Wolf, Carroll joined the club shortly after it was organized in 1962. “Carroll was involved in nearly every show since, volunteering and as a dealer,” Wolf said. Carroll and his wife, Bev, were both active members. She died in 2003. Dok Dehring, of Humboldt, at right, looks over a specimen Saturday with her husband Aaron Dehring and daughter Amelia Dehring, 10, during the River Valley Rockhounds, Inc. Gem, Mineral and Fossil Show on the East Campus of Iowa Central Community College. Dok Dehring has a pretty good idea of what she's looking at, she holds a master's degree in geology. She was noted for creating decorative trees with wire and gems. She learned the technique during a trip to Botswana, and even wrote a book about creating the displays. Carroll also made the trees. 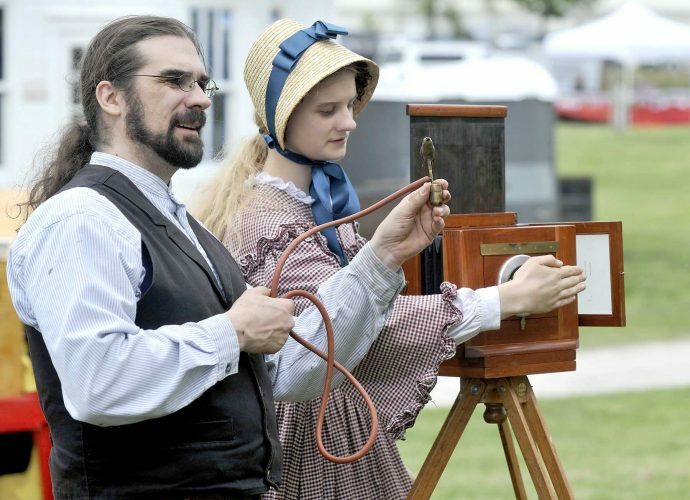 “Their gemstone trees and picture creations became a popular feature of the River Valley Rockhound shows and other shows throughout the country,” Wolf said. Wolf said Carroll continued making the creations even after his wife’s death. Carroll’s family will have a display of the remaining creations at the show this year. In addition to the display of Carroll’s craftsmanship, visitors will also be able to learn about several other things at displays created by Wolf. He will also have a stigmaria on display. “That’s the root system from a plant called a Lychopod,” he said. One of the traditions at the long running show, this is the 55th year, is a selection of different rock and mineral specimens that children can take home with them to get their own collections started. They are given an egg carton and get to pick out a dozen. Wolf said it remains a popular feature of the show. There is also the annual silent auction of various specimens that visitors can add to their collections as well as door prizes. The show is April 28- 29 on the Webster County Fairgrounds. Saturday hours are 9 a.m. to 5 p.m. Sunday hours are 11 a.m. to 4 p.m. Admission is $1 for adults. $2 for a family and children under 12 are admitted free. Wolf said about eight vendors are expected for the show. The club has about 20 active members.